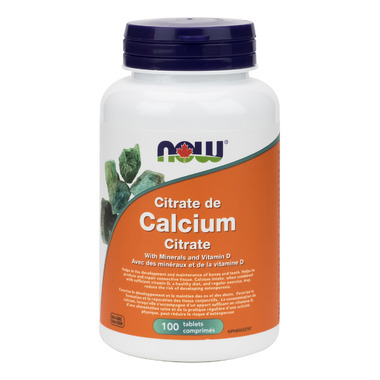 To be as gentle on your system as possible, Calcium Citrate is a form of calcium that is readily digested and absorbed. The trace minerals and Vitamin D are added because of their essential role in bone metabolism. Tablet form allows for greater potency per pill. Calcium when combined with sufficient vitamin D, a healthy diet and regular exercise, may reduce the risk of developing osteoporosis. Suggested Usage: As a dietary supplement, take 2 tablets daily, preferably with food. Other Ingredients: Cellulose, Stearic Acid (vegetable source), Croscarmellose Sodium, Magnesium Stearate (vegetable source), Silica and Vegetable Coating. Contains soy derivative. Chose this type of calcium after researching different ones available. Apart from the extras in the calcium (vitamin D, etc.) it also seems to help with constipation problems. One of the best forms of calcium. The cheaper types of calcium (carbonate) causes some gastro issues. NOW Foods is pretty modest with this supplement, given that it's not just calcium you're getting (although by itself, that would be valuable enough.) The zinc, magnesium, and vitamin D content are also helpful. If you are interested in promoting good bone health, this is a great choice for you.